Bring a rustic farmhouse look to your entertainment space with this large TV stand with barn door hardware for its two doors. 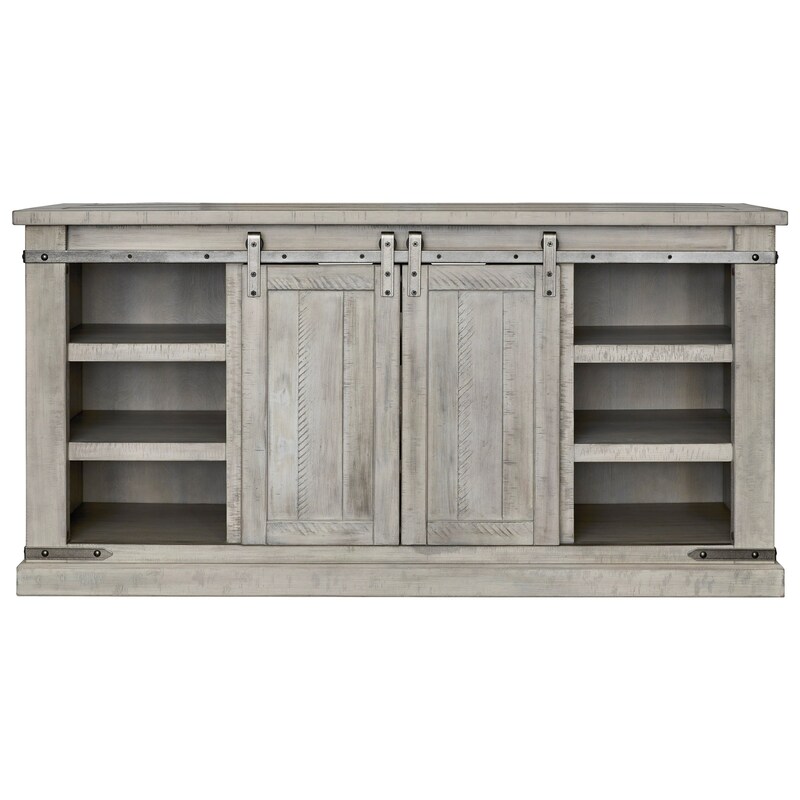 Made with pine veneers and solids in a white washed finish, while corner metal brackets and the barn door style hardware are a dark antique gray finish. The Carynhurst Rustic White Large TV Stand with Barn Door Hardware by Signature Design by Ashley from Nashco Furniture - Nashville. We proudly serve the Nashville, Franklin, Brentwood, Clarksville, Green Hills, Davidson County, Williamson County, Tennessee area. Product availability may vary. Contact us for the most current availability on this product. Handles & Hardware Sliding barn door detailing with metal accents. Metal brackets and hardware is finished in a dark antiqued gray coloration. Storage 2 doors on barn door hardware. 9 total shelves: 3 center shelves, additional 3 shelves behind each door. Case Construction Pine veneers and solids. Plank-look sides and doors. Browse other items in the Carynhurst collection from Nashco Furniture - Nashville in the Nashville, Franklin, Brentwood, Clarksville, Green Hills, Davidson County, Williamson County, Tennessee area.